This pioneering new recording—a showcase for the virtuoso talents of the Holst Singers—presents all fifteen of Villette’s unaccompanied choral works and his two motets for choir and organ. Pierre Villette might best be regarded as a stylistic bridge between Debussy and Fauré on the one hand and Poulenc and Messiaen on the other. A world rich in the familiarities of Gregorian chant infuses much of his choral output, while ambitious chromaticisms and textural gestures create effects which are at once spiritual and sensuous. This is the music of private prayer set in the context of an incense-filled Gothic Über-Cathedral. Under their long-standing director of music Stephen Layton, the Holst Singers have established themselves firmly at the top of the country’s league of chamber choirs. This new programme can only enhance their justly deserved reputation. Over the course of his life Pierre Villette produced around eighty pieces of music—mostly small-scale works for orchestra, chamber ensembles and choir. Although he was a contemporary of Pierre Boulez at the Conservatoire National Supérieure de Musique in Paris, Villette ploughed his own furrow when it came to composition. He eschewed the uncompromising modernity of much French twentieth-century music, drawing instead on early music, especially Gregorian chant, and the exotic textures and harmonies inherited from Poulenc and Messiaen. He loved the music of Fauré and Debussy and greatly admired Stravinsky, yet his musical language is unique—something Stephen Layton describes as both ‘spiritual and sensual’. Villette was born in 1926 into a musical family. His mother was a competent pianist and he counted amateur musicians among his aunts and uncles. The main musical influence in his life, however, came from his father. Henri Villette ran a joinery business but he was also a composer, pianist, organist, violinist and violist who encouraged his son’s passion for music. From the tender age of six Villette fils sang in the choir of St Evode cathedral in Rouen, where he was introduced to Gregorian chant and music from a range of composers including Palestrina, Mozart and Franck. In his early teens he began playing the organ in a local church and such was his talent that at the age of fifteen he passed the entrance exam for the Paris conservatoire, with the help of the composer Maurice Duruflé. By the following year Villette had written his first complete work, a Marche fantaisiste for orchestra. But with France under Nazi occupation his early years of study were interrupted and Villette was obliged to join his family in Normandy. With the liberation of Paris in 1944 Villette was eventually able to return to the conservatoire once again, where he studied composition with Henri Busser. The Ave verum and the gentle Salve regina date from this same year. In both motets Villette uses chromatic harmonies to draw out the meaning of the words, bringing an added piquancy to the moment where the text refers to death in the Ave verum and to tears in the Salve regina. The conclusion of the Ave verum is particularly intense with a hushed phrase for women’s voices echoed by the men and then followed by a dramatic outburst. At the very end the music comes to rest on an unresolved chord, a device that Villette chose time and time again to round off his choral works. Another enforced interruption to Villette’s musical training came several years later in 1948 with the death of his father, and Villette returned home once again to run the family business. The strain took its toll on his health however and he underwent numerous operations before surgeons finally removed one of his lungs. He spent long periods in the Alps recuperating, but in spite of his fragile health he continued to compose. In 1954 Villette wrote the motet Salutation angélique for soprano, which exists in three versions—one with organ, the second with orchestra and the third with string orchestra. The beguiling opening provides no clue to the more animated middle section that follows. In the same year he also produced O salutaris hostia, a work notable for its jazzy harmonies. These found their full expression a year later in a piece for orchestra entitled Blues. Around the same time Villette composed the Hymne à la Vierge and dedicated it to his future wife, Josette. The hymn’s simple melody is reserved for the sopranos, while the other three voices have some interesting inner parts and chromatic inflections, particularly towards the end of the piece. In 1957 Villette took up a job as head of the Conservatoire de Besançon, a post that began his long stint in academia. During his ten years there he wrote only a handful of works, of which four were for choir. In 1959 he composed the eight-part motet O sacrum convivium, a piece which shows the influence of Messiaen, whom he admired. The music at the words ‘mens impletur gratia’ could even be a nod towards Messiaen’s early motet of the same name, as the melody is very similar. Villette’s work wears its heart on its sleeve, its shimmering chords with added sixths and seconds particularly effective in creating a sensuous mood. Here the composer’s flexible approach to word-setting comes into play, with fifteen tempo changes indicated in a motet lasting less than four minutes. The Strophes polyphoniques pour le Veni Creator naturally require a similarly fluid approach to the text, alternating chant and response. The final ‘Amen’ is a rare example of true counterpoint in Villette’s choral music. Villette did not, on the whole, compose to order, although he did receive a number of commissions throughout his creative life. He wrote music for personal expression and found inspiration largely in his strong faith, which probably explains why so much of his vocal music is religious. In 1959 he composed the motet Tu es Petrus to mark the enthronement of the Archbishop of Besançon. The work exists in three different arrangements: the version for choir and two organs is the original, but it was later orchestrated and there is also an arrangement, performed here, with just one organ. As one would expect, the music is stately, but the motet also contains a more tender interlude. The repetition of the words ‘Tu es Petrus’ provides a particularly rousing finale. There is nothing quite so robust in mood in the whole of Villette’s choral music. Adoro te, which dates from 1960, marks a return to more familiar territory, but still contains many of the lush harmonies typical of Villette’s music at this time. After Adoro te, Villette wrote no motets at all for twenty-three years, but he did compose two large-scale masses, one of which—the Messe en français—is yet to be published. Villette was to hold only one other post in his life, that of director of the Conservatoire d’Aix-en-Provence where he stayed until his retirement in 1987. His students remember him as a very kind, likeable man who was passionate about music education: he presided over the expansion of the conservatoire and did a great deal to enhance musical life in Aix. Many of his works were premiered by his students, but Villette’s choral music has achieved greater recognition abroad largely through the efforts of British choirs. The earliest of these was the Worcester Cathedral Choir with their director Dr Donald Hunt, who took Villette’s music to an international public by recording and performing his motets in the mid-1970s. Hunt’s recordings attracted the composer’s attention and so began a lasting friendship. In 1983 Villette dedicated the motet Attende, Domine to Hunt and the choir. It is one of his most ambitious choral works, with a dark, anguished atmosphere as befits the penitential text. The motet begins with a descending whole-tone motif that recurs throughout, punctuating the adventurous sonorities that often begin in close harmony and expand and contract like a concertina. In the same year Villette produced O magnum misterium, whose opening bars are in a similarly dark fashion to Attende, Domine, but on the whole the music is quite restrained. This piece shows Villette’s contemporary influences well: it begins in a gentle mood akin to his teacher Duruflé’s motet Tantum ergo, with a particularly tender moment introduced by the tenors when the beasts gather around the crib. Gradually the harmonies become more sensual as the piece nears its conclusion, approaching the sound-world of Messiaen’s O sacrum convivium—especially the way the sustained notes in the singers’ lower registers end on a glowing sixth chord. Inviolata marks a high point of complexity in Villette’s motets. Not only is it texturally adventurous, it is harmonically complex too with block chords built of clashing tonalities contributing to its exotic sound world. 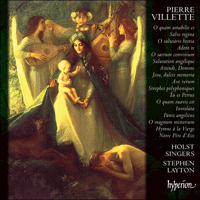 After Inviolata in 1991 Villette employs a more simplified musical language in the remaining five motets. O quam amabilis es is a world away from the quasi-orchestral fabric of Inviolata; the sensual harmonies are still there in Villette’s use of added 7th and 9th chords and the soft dissonances created by suspensions, but the music is less intense in character. Notre Père d’Aix is simplicity itself; some unexpected turns of phrase intensify the mood and occasionally the music rises to forte, but in general this is a gentle, diatonic setting of the Lord’s Prayer. The Pentecostal motet O quam suavis est is dedicated to Hélène Guy, a music educator based in Aix, and her Ensemble Vocal de Provence. The piece looks to the rapt side of Messiaen’s early music once again, with its ethereal harmonies. Jesu, dulcis memoria shares with O quam suavis est a flowing approach to the musical line: the parts move more independently of one another than in Villette’s earlier vocal works. Occasional chromatic inflections in the vocal lines add an element of surprise. In his final motet, Panis angelicus, Villette has stripped the music down to the bone, using harmonic colour judiciously to highlight his plea for God to lead the way. Returning as the music does to the clarity of the opening makes this all the more poignant. Pierre Villette composa quelque quatre-vingts œuvres—essentiellement des pièces à petite échelle pour orchestre, ensembles de chambre et chœur—en traçant son propre sillon, et ce bien qu’il ait fréquenté le Conservatoire National Supérieur de Musique de Paris en même temps que Pierre Boulez. Évitant la modernité rigide d’une grande partie de la musique française du XXe siècle, il s’appuya sur la musique ancienne, notamment le chant grégorien, ainsi que sur les textures et les harmonies exotiques héritées de Poulenc et de Messiaen. Adorer la musique de Fauré et de Debussy, tout en admirant énormément Stravinsky, ne l’empêcha pas d’avoir un langage musical unique—à la fois «spirituel et sensuel», pour reprendre les mots de Stephen Layton. Villette naquit en 1926 dans une famille musicienne: sa mère était une habile pianiste, tandis que certains de ses oncles et tantes étaient des musiciens amateurs. Mais la grande influence musicale de sa vie fut celle de son père, Henri Villette, qui encouragea sa passion pour la musique—lui-même était directeur d’une entreprise de menuiserie, mais aussi compositeur, pianiste, organiste, violoniste et altiste. Dès l’âge de six ans, Villette fils chanta dans le chœur de la cathédrale Saint-Evode à Rouen, où il fut initié au chant grégorien et à la musique de compositeurs allant de Palestrina à Franck en passant par Mozart. À peine adolescent, il commença de tenir l’orgue d’une église paroissiale avec un talent tel que, à quinze ans, il réussit l’examen d’entrée au Conservatoire de Paris, avec l’aide du compositeur Maurice Duruflé. L’année suivante, il acheva sa première œuvre complète, une Marche fantaisiste pour orchestre. Mais l’occupation nazie interrompit ses premières années d’études et il dut rejoindre sa famille en Normandie. Une fois Paris libéré, en 1944, Villette put enfin retourner au Conservatoire, où il étudia la composition avec Henri Busser. De cette année-là datent deux motets—l’Ave verum et le paisible Salve regina—dans lesquels Villette utilise des harmonies davantage chromatiques pour faire ressortir le sens des mots, ajoutant du piquant là où le texte évoque la mort (Ave verum) et les larmes (Salve regina). La conclusion de l’Ave verum est particulièrement intense, avec une phrase étouffée pour voix de femmes, à laquelle répondent les hommes, juste avant une explosion dramatique. À la toute fin, la musique se pose sur un accord non résolu, un procédé dont Villette usa maintes fois pour clore ses œuvres chorales. Quelques années plus tard, en 1948, Villette fut de nouveau contraint d’interrompre ses études et de rentrer chez lui pour reprendre les rênes de l’affaire familiale, à la mort de son père. Mais la pression ébranla sa santé et il subit de nombreuses opérations jusqu’à ce que les chirurgiens finissent par lui enlever un poumon. Dès lors, il passa de longues périodes de convalescence dans les Alpes, mais continua de composer malgré sa santé fragile. En 1954, il écrivit Salutation angélique, un motet pour soprano qui existe en trois versions: avec orgue, avec orchestre et avec orchestre à cordes. La charmante ouverture n’annonce en rien la section médiane, plus animée, qui suit. Cette même année, Villette produisit aussi O salutaris hostia, une œuvre qui vaut par ses harmonies jazzy. Ces dernières trouvèrent leur pleine expression un an plus tard, dans une pièce pour orchestre intitulée Blues. Vers la même époque, Villette composa l’Hymne à la Vierge (dédiée à sa future femme, Josette), dont la mélodie simple est réservée aux sopranos, les trois autres voix se voyant attribuer d’intéressantes parties intérieures et inflexions chromatiques, surtout vers la fin de l’œuvre. En 1957, Villette devint directeur du Conservatoire de Besançon, un poste qui marqua le début de sa longue implication dans le monde universitaire. Les dix années qu’il passa là ne furent marquées que par quelques œuvres, dont quatre pour chœur. En 1959, il composa ainsi le motet à huit parties O sacrum convivium, révélateur de l’influence d’un musicien qu’il admirait: Messiaen. La mise en musique des mots «mens impletur gratia» pourrait même être un hommage à O sacrum convivium, un motet de jeunesse de Messiaen présentant une mélodie fort semblable. Le motet de Villette se met à nu, ses accords scintillants (avec sixtes et secondes ajoutées) concourant tout spécialement à créer une atmosphère sensuelle. C’est ici qu’intervient l’approche flexible que le compositeur a de la mise en musique, avec quinze changements de tempo dans un motet de moins de quatre minutes. Les Strophes polyphoniques pour le Veni Creator appellent, bien sûr, une approche tout aussi fluide du texte, avec une alternance chant/réponse. L’«Amen» final est l’un des rares vrais contrepoints de toute la musique chorale de Villette. En général, Villette ne composa pas sur commande, même si des commandes ponctuèrent toute sa vie créatrice. Il écrivit de la musique pour s’exprimer et puisa largement son inspiration dans sa foi intense—d’où, probablement, le fait qu’une grande partie de sa musique vocale soit religieuse. En 1959, il composa le motet Tu es Petrus pour l’intronisation de l’archevêque de Besançon. Cette œuvre se décline dans trois arrangements différents: originellement pour chœur et deux orgues, elle fut ensuite orchestrée, avant d’être arrangée pour un seul orgue. Naturellement, la musique est majestueuse, mais le motet renferme aussi un interlude plus tendre. La répétition des mots «Tu es Petrus» offre un finale particulièrement vibrant et aucune autre pièce chorale de Villette n’arbore un climat aussi vigoureux. Adoro te (1960) marque un retour en terrain plus connu, mais recèle encore nombre des harmonies luxuriantes du Villette de l’époque. Après Adoro te, Villette resta vingt-trois ans sans écrire le moindre motet, mais il composa deux messes d’envergure, dont l’une—la Messe en français—reste à publier. Après Besançon, Villette n’occupa qu’un seul autre poste, celui de directeur du conservatoire d’Aix-en-Provence, où il demeura jusqu’à sa retraite, en 1987. Ses étudiants gardent de lui le souvenir d’un homme très gentil, sympathique et passionné par l’enseignement de la musique; il présida au développement du conservatoire et fit beaucoup pour améliorer la vie musicale aixoise. Quantité de ses œuvres furent créées par ses étudiants, mais sa musique chorale fut plus largement reconnue à l’étranger, surtout grâce aux efforts des chœurs britanniques. Le tout premier d’entre eux fut le Worcester Cathedral Choir, dirigé par le Dr Donald Hunt, qui enregistra et interpréta les motets de Villette au milieu des années 1970, faisant découvrir sa musique à un public international. Ces enregistrements aittrèrent l’attention du compositeur et marquèrent le début de sa longue amitié avec Hunt. En 1983, Villette dédia à ce dernier, ainsi qu’au chœur, le motet Attende, Domine, une de ses œuvres chorales les plus ambitieuses, dotée d’une atmosphère sombre et angoissée, comme il sied au texte pénitentiel. Ce motet s’ouvre sur un motif descendant par tons entiers qui revient sans cesse ponctuer les sonorités osées, lesquelles commencent souvent en harmonie serrée pour se déployer et se contracter comme un concertina. La même année, Villette produisit O magnum misterium, dont les mesures d’ouverture sont sombres comme Attende, Domine, mais dont la musique est, dans l’ensemble, toute en retenue. Cette pièce montre bien les influences contemporaines de Villette: elle démarre dans un climat paisible, apparenté au motet Tantum ergo de son professeur Duruflé, avec un moment particulièrement tendre introduit par les ténors, quand les animaux se pressent autour de la mangeoire. Les harmonies gagnent en sensualité à mesure que la pièce touche à sa conclusion pour finalement s’approcher de l’univers sonore du O sacrum convivium de Messiaen—surtout dans la manière dont les notes tenues, dans les registres inférieurs des chanteurs, s’achèvent sur un accord de sixte miroitant. Avec Inviolata, les motets de Villette sont au summum de leur complexité. Osée sur le plan de la texture, l’œuvre est aussi complexe sur le plan harmonique, avec des blocs d’accords faits de tonalités dissonantes qui contribuent à l’exotisme de son univers sonore. Après Inviolata (1991), Villette recourt, pour ses cinq derniers motets, à un langage musical simplifié. O quam amabilis es est ainsi à des lieues du tissu quasi orchestral d’Inviolata; certes, des harmonies sensuelles subsistent dans l’usage que fait Villette des accords de septième et de neuvième ajoutées ainsi que dans les douces dissonances engendrées par les suspensions, mais la musique présente un caractère moins intense. Notre Père d’Aix est la simplicité même; bien que certaines tournures de phrase inattendues intensifient le climat et que la musique s’élève parfois jusqu’à forte, il s’agit là d’un Notre Père globalement doux et diatonique. Le motet de Pentecôte O quam suavis est (dédié à Hélène Guy, éducatrice musicale à Aix, et à son Ensemble Vocal de Provence) regarde, lui aussi, vers le côté absorbé de la musique des débuts de Messiaen, aux harmonies éthérées. Jesu, dulcis memoria partage avec O quam suavis est une approche fluide de la ligne musicale, les parties évoluant de manière plus indépendante que dans les pages vocales antérieures de Villette. D’occasionnelles inflexions chromatiques, dans les lignes vocales, ajoutent un élément de surprise. Dans son dernier motet, Panis angelicus, Villette réduit la musique à l’essentiel, avec un usage judicieux de la couleur harmonique pour rehausser sa supplique demandant à Dieu de lui montrer la voie. Que la musique revienne, comme elle le fait, à la clarté initiale rend l’ensemble d’autant plus poignant. Im Verlauf seines Lebens schuf Pierre Villette ungefähr 80 Musikstücke—die meisten davon sind kleinere Stücke für Orchester, Kammerensemble und Chor. Villette war Kommilitone von Pierre Boulez am Conservatoire National Supérieure de Musique in Paris. Wie jener hätte er sich ebenso dem kompromisslosen Modernismus zuwenden können, aber in Sachen Komposition verfolgte er seinen eigenen Weg. Er enthielt sich der in der französischen Musik des 20. Jahrhunderts so häufig anzutreffenden Modernität und schöpfte stattdessen Anregung aus Alter Musik, besonders aus dem gregorianischen Choral, sowie aus den exotischen Texturen und Harmonien eines Poulencs und Messiaens. Villette liebte die Musik Faurés und Debussys, und er bewunderte Strawinsky sehr, und doch gelang es ihm über die Bewunderung und Einflüsse hinaus, eine eigene unverwechselbare, oder wie Stephen Layton es beschrieb, eine „sowohl vergeistigte als auch sinnliche“ musikalische Sprache zu entwickeln. Villette wurde in 1926 in eine musikalische Familie geboren. Seine Mutter war eine kompetente Pianistin, und unter seinen Tanten und Onkeln befanden sich viele fähige Amateurmusiker. Der wichtigste musikalische Einfluss in seinem Leben kam allerdings von seinem Vater. Henri Villette leitete eine Tischlerwerkstatt, war aber auch Komponist, Pianist, Organist, Violinist und Bratschist, der die Leidenschaft seines Sohnes für Musik schürte. Schon im frühen Alter von sechs Jahren sang Villette junior im Chor der Chambre de Saint Evode in Rouen, wo er gregorianische Choräle sowie die Musik von Palestrina bis Mozart und Franck kennen lernte. In seiner frühen Jugendzeit begann er die Orgel in einer nahe gelegenen Kirche zu spielen. Sein Talent war so groß, dass er mit nur 15 Jahren die Eignungsprüfung für das Pariser Conservatoire bestand, wobei ihn der Komponist Maurice Duruflé unterstützte. Im folgenden Jahr beendete Villette seine erste vollständige Komposition, einen Marche fantaisiste für Orchester. Seine frühen Studienjahre wurden allerdings durch die Besatzung Frankreichs durch die Nazis unterbrochen, und er sah sich gezwungen, zu seiner Familie in die Normandie zu ziehen. Mit der Befreiung von Paris 1944 konnte Villette schließlich wieder an das Conservatoire zurückkehren, wo er Komposition bei Henri Busser studierte. Das Ave verum und das sanfte Salve regina stammen aus diesem Jahr. In beiden Motteten bedient sich Villette chromatisch geschärfter Harmonien, um die Bedeutung der Worte herauszuheben. Dadurch verstärkt er die emotionale Intensität in dem Moment, wo sich der Text im Ave verum auf den Tod und im Salve regina auf Tränen bezieht. Der letzte Abschnitt im Ave verum ist besonders intensiv. Hier wird ein gedämpfter Gedanke in den Frauenstimmen von den Männern nachgeahmt, denen sich ein dramatischer Ausbruch anschließt. Am Ende beruhigt sich die Musik auf einem unaufgelösten Akkord, ein Mittel, das Villette immer wieder anwandte, um seine Chorwerke abzuschließen. Eine weitere Unterbrechung in Villettes musikalischer Ausbildung geschah einige Jahre später, als sein Vater 1948 starb. Villette wandte sich wieder nach Hause, um das Familiengeschäft zu übernehmen. Die Belastung legte sich allerdings auf seine Gesundheit, und er unterzog sich zahlreichen Operationen, bis die Ärzte schließlich einen seiner beiden Lungenflügel entfernten. Er verbrachte zur Erholung lange Perioden in den Alpen. Trotz seiner angegriffenen Gesundheit komponierte er weiter. 1954 schrieb Villette die Motette Salutation angélique, die es in drei Fassungen gibt—eine für Sopran und Orgel, eine für Sopran und Orchester und die dritte für Sopran und Streichorchester. Der betörende Anfang verrät nichts von dem ihm sich anschließenden aufgewühlten Mittelteil. Im gleichen Jahr schuf Villette auch O salutaris hostia, ein für seine Jazz-inspirierten Harmonien bekanntes Werk. Diese harmonische Welt fand ein Jahr darauf im Stück für Orchester mit dem Titel Blues ihre volle Ausprägung. Ungefähr zur gleichen Zeit komponierte Villette die Hymne à la Vierge und widmete sie seiner zukünftigen Frau Josette. Die einfache Melodie der Hymne bleibt den Sopranen vorbehalten, während die anderen drei Stimmen einige interessante innere Passagen und chromatische Verwicklungen vorzuweisen haben, besonders gegen Ende des Stückes. 1957 übernahm Villette die Position des Direktors am Conservatoire de Besançon, eine Stelle, die seine lange Amtszeit in akademischen Kreisen einleitete. In den zehn Jahren in Besançon schrieb er nur eine Hand voll Werke, von denen vier für Chor waren. 1959 komponierte Villette die achtstimmige Motette O sacrum convivium, die Einflüsse von Messiaen aufweist, den er bewunderte. Es gibt Grund zur Annahme, dass Villette bei den Worten „mens impletur gratia“ sogar direkte Anleihen aus Messiaens früher Motette gleichen Namens machte, da sich hier die Melodien sehr ähneln. Villettes Werk trägt seine Gefühle offen zur Schau, die schimmernden Akkorde mit hinzugefügten Sechsten und Sekunden sind bei der Schaffung einer sinnlichen Stimmung besonders wirksam. Hier zeigt sich anhand der 15 Tempoänderungen in einer Motette von weniger als vier Minuten Länge sehr deutlich der flexible Ansatz des Komponisten bei der musikalischen Interpretation der Worte. Die zwischen gregorianischem Choral und antwortendem Chorsatz alternierenden Strophes polyphoniques pour le Veni Creator erfordern natürlich eine ähnlich fließende musikalische Umsetzung des Textes. Das abschließende „Amen“ ist ein seltenes Beispiel für richtigen Kontrapunkt in Villettes Chormusik. Villette schrieb im Allgemeinen keine Auftragswerke, auch wenn in seiner künstlerischen Laufbahn eine Reihe solcher Aufträge an ihn herangetragen wurden. Er schrieb Musik, um seine persönlichen Gedanken und Gefühle auszudrücken. Anregung fand er hauptsächlich in seinem starken Glauben, was wohl erklärt, warum ein Großteil seiner Chorstücke Kirchenmusik ist. 1959 komponierte er Tu es Petrus zur Feier der Inthronisation des Erzbischofs von Besançon. Das Werk gibt es für drei verschiedene Besetzungen: Die Fassung für Chor und zwei Orgeln ist das Original, die später orchestriert wurde. Es gibt auch eine Fassung für nur eine Orgel. Wie zu erwarten ist die Musik feierlich, aber die Motette enthält auch ein zarteres Zwischenspiel. Die Wiederholung der Worte „Tu es Petrus“ liefert ein besonders aufregendes Finale. In Villettes gesamter Chormusik findet man nie wieder so einen robusten Frohsinn. Das von 1960 stammende Adoro te kehrt zu vertrauteren Gefilden zurück, enthält aber auch weiterhin viele solche satte Harmonien, die für Villettes Musik zu jener Zeit typisch waren. Nach Adoro te schrieb Villette 23 Jahre lang überhaupt keine Motetten mehr, aber er komponierte zwei groß angelegte Messen, von denen eine—die Messe en français—immer noch ihrer Veröffentlichung harrt. Villette sollte nur noch einen weiteren Posten in seinem Leben begleiten, nämlich den als Direktor des Conservatoire d’Aix-en-Provence, wo er bis 1987 verblieb und dann in den Ruhestand trat. Seine Studenten beschreiben ihn als einen sehr gütigen, liebenswerten Mann mit einer Leidenschaft für Musikpädagogik: Er leitete den Ausbau des Konservatoriums und trug erheblich zur Verbesserung des musikalischen Lebens in Aix bei. Viele seiner Werke wurden von seinen Studenten uraufgeführt. Villettes Chormusik dagegen fand zuerst im Ausland größere Anerkennung, hauptsächlich durch die Bemühungen britischer Chöre. Der erste dieser Chöre war der Kathedralchor von Worcester mit seinem Leiter Dr. Donald Hunt, der in der Mitte der 1970iger Jahre durch Einspielungen und Aufführungen Villettes Motetten einem internationalen Publikum vorstellte. Der Komponist wurde auf Hunts Aufnahmen aufmerksam, und so begann eine anhaltende Freundschaft. Villette widmete 1983 Hunt und dem Chor die Motette Attende, Domine. Sie gehört zu Villettes ehrgeizigsten Chorwerken und zeichnet sich durch eine dunkle, furchtsame, gut zum Bußtext passende Atmosphäre aus. Die Motette beginnt mit einem ständig wiederkehrenden Ganztonmotiv, das die abenteuerlichen Klangfelder unterbricht, die häufig mit Harmonien in enger Lage beginnen und sich wie eine Konzertina entfalten und zusammenziehen. Im gleichen Jahr schuf Villette O magnum misterium, eine Motette, deren einleitende Takte ähnlich dunkel gehalten sind wie das Attende, Domine. Aber im Großen und Ganzen ist die Musik ziemlich zurückhaltend. Dieses Stück zeigt deutlich die Einflüsse von Villettes Zeitgenossen: es beginnt in einer sanften Stimmung, die an die Motette Tantum ergo von Villettes Lehrer Duruflé erinnert. Hier gibt es einen besonders zärtlichen, von den Tenören vorgestellten Moment, wenn sich das Vieh um die Kribbe versammelt. Gegen Ende werden die Harmonien allmählich leidenschaftlicher und nähern sich der Klangwelt aus Messiaens O sacrum convivium an—besonders durch die Art, mit der die ausgehaltenen Noten in der tieferen Lage der Sänger auf einem glühenden Sechstakkord enden. Inviolata stellt unter Villettes Werken einen Höhepunkt in Sachen Komplexität dar. Diese Motette weist nicht nur experimentelle Texturen auf, sondern sie ist auch wegen der Blockakkorde, die sich aus reibenden Tonalitäten zusammensetzen und zu einer exotischen Klangwelt beitragen, harmonisch komplex. Nach Inviolata 1991 vereinfachte Villette die musikalische Sprache in seinen letzten fünf Motetten. O quam amabilis es bewegt sich im Vergleich mit dem fast orchestralen Geflecht von Inviolata in einer völlig anderen Welt. Man findet hier zwar immer noch Villettes sinnliche Harmonien, man braucht sich nur die Sept- und Nonenakkorde und die weichen, durch Vorhalte erzeugten Dissonanzen anschauen, aber die Musik ist vom Charakter her weniger angespannt. Notre Père d’Aix ist die Einfachheit selber. Einige unerwartete Gesten mögen die Stimmung anheizen, und die Musik steigert sich tatsächlich gelegentlich bis zu einem Forte, aber im Allgemeinen ist diese Motette eine sanfte, diatonische Vertonung des Vaterunsers. Die Pfingstmotette O quam suavis est ist Hélène Guy, einer Musikpädagogin aus Aix, und ihrem Ensemble Vocal de Provence gewidmet. Das Stück mit seinen ätherischen Harmonien wendet sich noch einmal der leidenschaftlichen Seite aus Messiaens früher Musik zu. Jesu, dulcis memoria hat ähnlich fließende Linien wie O quam suavis est: Die Stimmen bewegen sich unabhängiger voneinander als in Villettes früherer Chormusik. Gelegentliche chromatische Wendungen in den Gesangsstimmen liefern ein Überraschungselement. In seiner letzten Motette Panis angelicus reduzierte Villette die Musik auf ihre Grundelemente und setzte harmonische Farben sehr vorsichtig ein, um seiner Bitte an Gott, den Weg zu zeigen, Ausdruck zu verleihen. Durch die Rückkehr der Musik zur Klarheit des Anfangs wirken diese Harmonien umso beeindruckender.